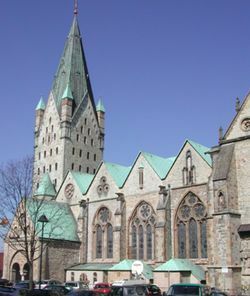 Paderborn is a city in North Rhine-Westphalia, Germany. Paderborn is on the Autobahn A33. Paderborn/Lippstadt airport is located about 15 kilometers south-west of Paderborn. Destinations are Munich, London, Manchester, Bournemouth, Zurich and Vienna. There is an express bus every hour between the airport an bus station. Paderborn station lies on the railway line from Cologne / Dusseldorf to Leipzig and Dresden. Paderquellgebiet - An area of more than 200 springs, the source of the Pader river, the shortest river in Germany. Great downtown area. Libori Galeri and Suedring are local shopping locations. Check out the street "Die Grube" between Cathedral and "Kamp". But there is not so big choice for the Clothes and Shoes. If you have an opportunity to go to Dortmund or Dusseldorf, do it. Sunday Brunch is a must while in Germany. There are plenty of restaurants along Kamp within which one may find time well spent. Alex and Feuerstein are two examples of where one might find brunch. The Auld Triangle is a bar to find international students on Tuesday nights. Sappho is a bar and discotheque with alternative music. The Gyros with mayonnaise just next to the entry is a good fatty basis for a night. Afterwards (in the morning) a visit to nearby Limericks is obligatory. The tapas bar Paderschänke offers spanish ambiente, snacks and wine. The Biergarten on Mühlenstraße is the biggest one in Paderborn. The one behind the pub "Alles Ist Gut" probably the smallest. This page was last edited on 16 August 2015, at 16:31.